Truffle Dog Company is a global source for online truffle dog training, native truffle sales, harvesting services for orchards, consultation services and in person training for professional and recreational truffle dog teams. Alana McGee, CPDT-KA, has over ten years of experience training and educating humans and canines with reward based systems about early socialization, development during critical periods, and canine scent detection, specifically regarding truffles. Alana is one of only a handful of proven professional truffle dog handlers in all of North America who harvests native truffles as well as works on European style plantations or truffieres. 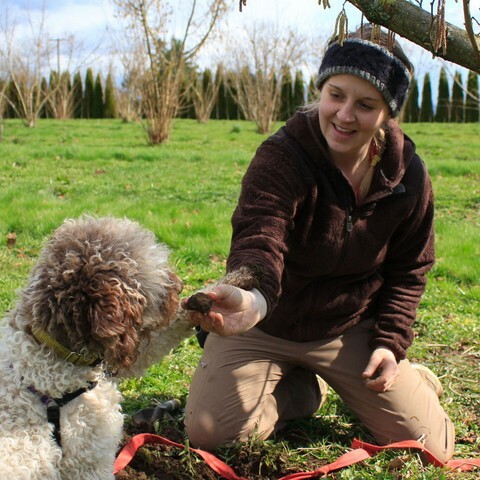 In 2013 Alana and her truffle dogs found the first ever cultivated Perigord truffles in Canada. Alana is one of the driving forces behind the emergence of using dogs to harvest and locate truffles in the Pacific Northwest and for use in scientific discovery in other parts of North America as well as helping to establish the culinary marketplace and build the infrastructure for Pacific Northwest truffles, on a global scale, and has developed a training curriculum specifically designed for truffle dog teams working on commercial orchards. Alana also teaches seminars, presents scientific papers, and works closely with leading mycologists and scientists worldwide on the developing science and understanding of truffle cultivation, sustainability of wild harvests, canine olfaction regarding truffles, and the practical application of trained truffle dogs on commercial truffieres. She has a vast network of contacts in the truffle world including leading mycologists, truffle growers, and truffle harvesters from all over the globe. She is currently working gathering scientific data about distribution and density of various native truffle species across North America. Alana is passionate about scientific discovery and truffle hunting with dogs. It is an enthusiasm she exudes when teaching truffle hunting techniques to students. She is also an active member of the Lagotto Romagnolo Club of America and participates in herding with her Australian Shepherd.